Tennis player Maria Sharapova addresses the media regarding a failed drug test at The LA Hotel Downtown on March 7, 2016 in Los Angeles, California. Tennis star Maria Sharapova says she failed a drug test at the Australian Open. The five-time major champion took full responsibility for her mistake when she made the announcement at a news conference Monday in Los Angeles. The former world No. 1 could face a lengthy ban from the International Tennis Federation. "I know that with this, I face consequences," Sharapova said. "I don't want to end my career this way, and I really hope I will be given another chance to play this game." The 28-year-old Sharapova said she tested positive for meldonium, which she said she has been taking for 10 years for numerous health issues. Meldonium, which is thought to be widely used by Russian athletes, became a banned substance this year under the WADA code, and Sharapova claimed she didn't notice its addition to the banned list. Meldonium, also known as mildronate, is a Latvian-manufactured drug popular for fighting heart disease in former Soviet Union countries. Meldonium treats ischemia, or lack of blood flow, but can be taken in large doses as a performance-enhancer that increases exercise capacity. The ITF's anti-doping program announced in a statement that Sharapova will be provisionally suspended starting this weekend while her case is examined. WADA spokesman Ben Nichols said the organization "will refrain from commenting further until a decision has been issued by the ITF. Following that, WADA will review the reasons for the decision and subsequently decide whether or not to use its independent right of appeal to the Court of Arbitration for Sport." Sharapova said she tested positive in an in-competition test at the Australian Open, where she lost to Serena Williams in the quarterfinals on Jan. 26. Sharapova hasn't played since then while recovering from a forearm injury, and she had already dropped out of the BNP Paribas Open in Indian Wells, which begins this week. Several athletes have tested positive for meldonium since it was banned in January, including two Ukrainian biathletes and Russian cyclist Eduard Vorganov. Earlier Monday, Russia's Ekaterina Bobrova, a European champion ice dancer, told local media she had tested positive for meldonium. Sharapova said she began taking meldonium for "several health issues I had back in 2006," including a magnesium deficiency, regular influenza, "irregular" heart test results and early indications of diabetes, of which she has a family history. Sharapova and her attorney declined to say where Sharapova was put on the drug or where she gets it now, citing the ongoing process with the ITF. Sharapova and all players were notified of the changes in the WADA banned substances list shortly before Christmas, but Sharapova said she simply missed the change, failing to click on a button that listed the new substances in the email. "I have to take full responsibility for it," Sharapova said. "It's my body, and I'm responsible for what I put into it." 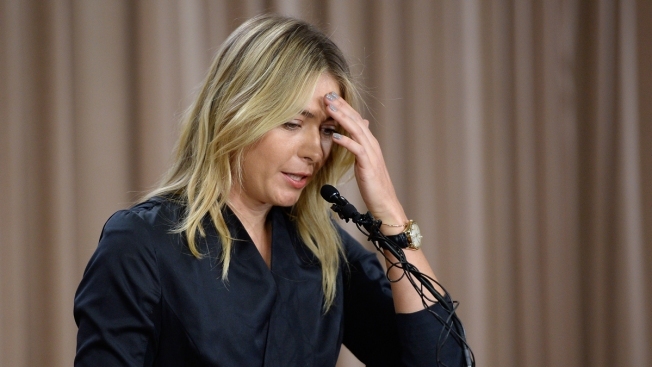 Reedie said he was unaware of Sharapova's case until she announced it at the news conference. "I understand the drug is sold particularly in Eastern Europe," he told the AP in a telephone interview. "You can almost get it over the counter. For stronger versions, you might need a prescription. There has been a whole rash of these cases since the 1st of January when it appeared on the banned list. This might not be happening if athletes would be taking more care of the things that are on the list." Reedie said meldonium can be a "very strong medicine," and that's why WADA scientists decided to place it on the prohibited list. "Clearly they believe it fulfilled the criteria and should be there," he said. Sharapova has 35 career singles titles and over $36 million in career earnings. She is currently No. 7 in the WTA rankings after playing just three tournaments and the Fed Cup final in the last eight months since Wimbledon due to injuries. "I am very saddened to hear this news about Maria," WTA CEO Steve Simon said in a statement. "Maria is a leader and I have always known her to be a woman of great integrity. Nevertheless, as Maria acknowledged, it is every player's responsibility to know what they put in their body and to know if it is permissible. This matter is now in the hands of the Tennis Anti-Doping Program and its standard procedures. The WTA will support the decisions reached through this process." Sharapova is thought to be the world's highest-paid female athlete due to her extensive business ventures and endorsement deals. Forbes estimated her earnings at $29.5 million for 2015, with $23 million from off-court ventures. Sharapova has been among the best players of her generation since bursting onto the scene as a 17-year-old Wimbledon champion in 2004, beating Williams in the final. She won the U.S. Open in 2006 and the Australian Open in 2008 before finally completing the career Grand Slam with French Open titles in 2012 and 2014. She became the world's top-ranked player in August 2005 and held the ranking five times for 21 weeks during her career. While she never came close to matching Williams' 21 Grand Slam titles, her five Grand Slam titles rank behind only Serena and Venus Williams among active players. Sharapova has struggled with injuries throughout her career, repeatedly forcing her to take extended breaks from competition. She had surgery to repair a torn rotator cuff, forcing her to change her serving motion, and has struggled with hamstring injuries. Sharapova was born in Russia and lived briefly in southern Sochi before moving to Florida as a child to begin her tennis career. She lives primarily in the Los Angeles area now.